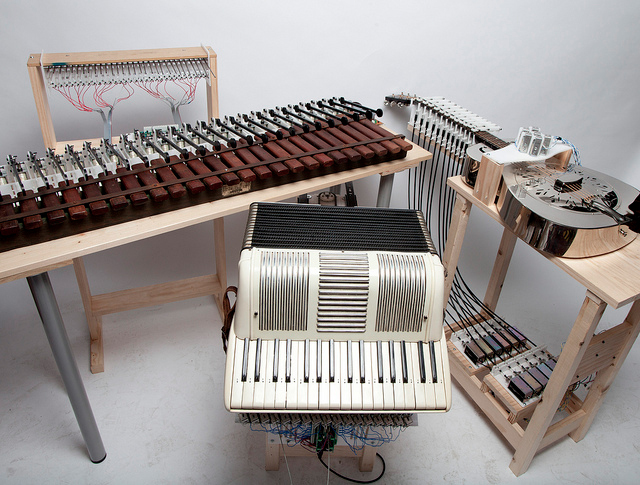 Reception for the artist and his mechanical orchestra that tracks a person's voice from inside an isolation booth and transmutes it into a work for chamber ensemble. Free and open to the public. 108 Leonard Street, 13th Floor. Bring a photo ID. Confirmed RSVP required to events@artonair.org. No admittance after 7pm. 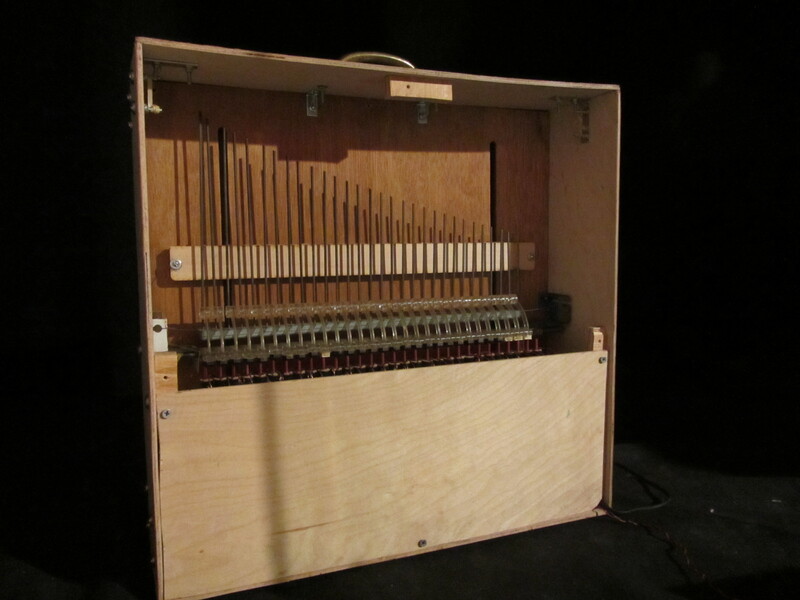 Plus, his wonderful Vexbot plays Satie! The night also marks one of the last chances to see Dark Paradise and Papo Colo. The studio room installation of Nomi Ruiz will also be on view during the event. The Singing Room is a place for anyone to sing freely, and in public. The room has been built with the "Shy Person" in mind, allowing them to sing without being exposed to the assumed scrutiny of others. Visitors are invited to sing in a small sound proof room. As they sing, the musical instruments outside of the room, abstractly interpret their singing. Each syllable pronounced by the singer is projected as musical and/or acoustic sounds. The installation is deliberately loud, further ensuring that that Shy Person cannot be heard. This project was initially commissioned by the Métamatic Research Initiative in 2011 and was completed in March 2013. It will be installed at Basel's Tinguely Museum in the fall of 2013. From May 2-9, 2013 Brooklyn based, interactive sound art and installation artist, Ranjit Bhatnagar will be sharing The Singing Room with Clocktower visitors. The Singing Room is a place for anyone to sing freely and in public. The room has been built with the "Shy Person" in mind, allowing him or her to sing without being exposed to the assumed scrutiny of others. Visitors are invited to sing in a small sound proof room. As they sing, the musical instruments outside of the room, abstractly interpret their singing. Each syllable pronounced by the singer is projected as musical and/or acoustic sounds. The installation is deliberately loud, further ensuring that that Shy Person cannot be heard. This project was initially commissioned by the Métamatic Research Initiative in 2011 and was completed in March 2013. It will be installed at Basel's Tinguely Museum in the fall of 2013.